Yowza! What’s up with that strong Kiwi rally right after New Zealand’s quarterly CPI release? Are traders starting to price in an RBNZ rate hike? 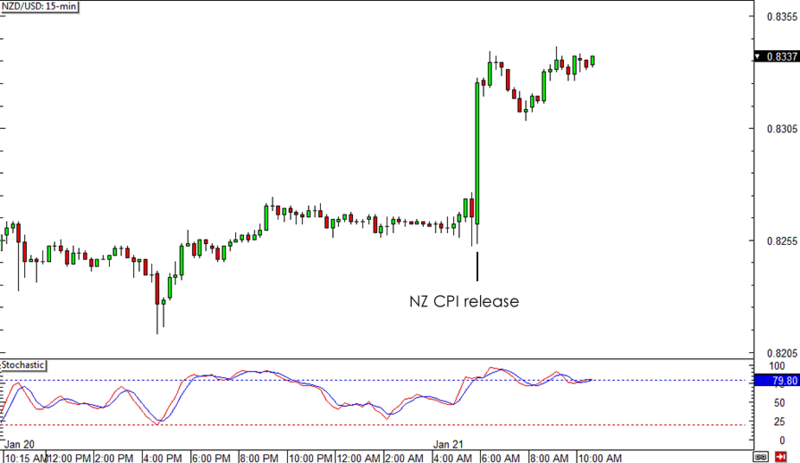 As you can see from NZD/USD’s 15-minute chart, the pair spiked by nearly 80 pips within minutes of the actual release. As it turns out, the inflation report showed that price levels rose by 0.1% in Q4 2013 instead of staying flat as market analysts predicted. On an annual basis, price levels rose by 1.6% in 2013, marking its highest year-over-year rise since 2012. With that, market gurus are starting to speculate that the RBNZ will start hiking rates as early as their January meeting next week! Recall that RBNZ Governor Wheeler recently hinted that the central bank might consider raising rates this year in order to keep strong inflationary pressures in check. After all, concerns about potential property price bubbles in Auckland and Christchurch could keep adding to upward price pressures. The cost of new housing is up by 1.1% in the quarter, with a 1.6% rise in property maintenance and a 0.5% uptick in household utilities. For 2013, construction costs surged by 4.7%. ANZ economists project that the RBNZ will hike its 2.50% benchmark rate this January, as both inflation and growth figures have surprised to the upside. “While the January OCR decision is finely balanced, we expect the RBNZ to raise the OCR at next week’s OCR Review and follow up with two additional hikes in subsequent meetings,” remarked ANZ chief economist Cameron Bagrie. However, others expect the central bank to wait until March to tighten monetary policy. Although the odds of a rate hike next week have drastically increased, Westpac chief economist Dominick Stephens pointed out that the stronger than expected CPI was mostly a result of higher airfares, housing costs, and dairy prices. On the other hand, prices of vegetables slipped by a whopping 20% while petrol prices dipped by 3.5%. Do you think that the strong CPI report could push the RBNZ to hike rates next week? Let us know by voting through the poll below!